Relax and unwind after a long day at work when you add this handsome contemporary chaise to your living room suite. 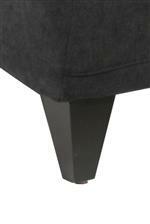 Tapered feet, tufting and welt details give this piece all the style that you have been searching for. Gather your family and friends to watch TV and movies with you while you relax on this chaise. The Brody Chaise by Jonathan Louis at HomeWorld Furniture in the Hawaii, Oahu, Hilo, Kona, Maui area. Product availability may vary. Contact us for the most current availability on this product. Bring contemporary style into your living room with the addition of this collection. Each piece showcases rounded track arms, welt cording, tufting and defined tapered legs for a sleek look. The plush cushions will help you relax as you enjoy quality time with your family and friends. The Brody collection is a great option if you are looking for furniture in the Hawaii, Oahu, Hilo, Kona, Maui area. Browse other items in the Brody collection from HomeWorld Furniture in the Hawaii, Oahu, Hilo, Kona, Maui area.